Toast Meets World is the adorable Cavalier King Charles Spaniel who was rescued from a Puppy Mill in North Carolina in 2011 by fashion model and publicist Katie Sturino. Toast’s mom, who is already Instagram famous herself, helped launch her dog’s career and is helping Toast live up to her “meets world” name in NYC. “Toasty” has met everyone from celebrities to supermodels while walking the red carpet, going to film sets and even appearing on Good Morning America. 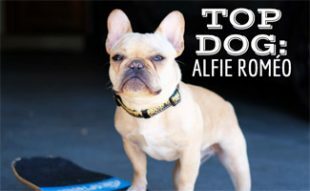 And Toast is using her celebrity dog status to raise awareness for pet adoption and rescue. 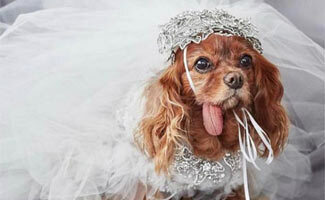 In 2016, Toast married her fellow furry friend Finn and the two registered on Zola Wedding Registry to gather contributions for puppy mill rescue organizations. On top of that, Toast has a book (ToastHampton: How to Summer in Style) and amazing style. 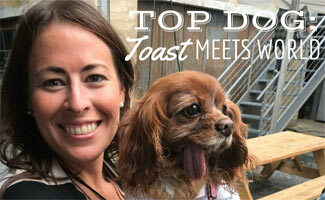 We count ourselves so lucky to have had the pleasure of meeting Toast (and her adorable tongue) last month. 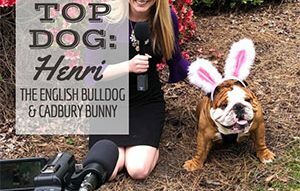 We took the opportunity to ask her a few questions for our latest Top Dog interview. You have a great sense of style, were do you get it from? Thank you! I totally take cues from my stage mom, Katie Sturino of The 12ish Style. I’d have to say my other style icon is Iris Apfel. My fashion motto is “the bigger, the better”, and obviously be chic… duh. You’re from NC but what do you love about living in NYC? It’s true, I’m a Southern girl at heart. I love NYC though – the shopping, great restaurants, and hanging out with fellow models like Karlie Kloss. If you could have toast with anyone who would it be and why? Definitely when my sisters Muppets Revenge and Underpants the Dog try to steal the spotlight from me. They’re always complaining because they’re less famous. Tell us what it’s like to share the spotlight with your siblings? Honestly, it’s my pet peeve! I understand that Muppet feels threatened by my stardom, but I can’t help it that I’m prettier. At the end of the day though, I still love her. Any details you can share about your wedding to Finn? My wedding day was one of the most glamorous days of my life. I wore a custom Marchesa wedding dress and tonsssss of diamonds. My wedding even ended up on an episode of The Real Housewives of New York! 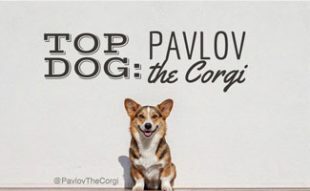 How can people help the dog community? You can always help when you adopt, don’t shop! Rescuing a dog is the best way to help former puppy mill pups. Any advice for dogs looking to become internet famous? You have to have an edge. Find something that makes you different and run with it! Who are your top celebrity crushes? Hmm… besides myself? I love Kate Upton, and Simon Doonan walked me down the aisle at my wedding. Don’t tell Finn, but Menswear Dog is a HUNK! Have you purchased your copy of Toast Hampton yet? It’s my book that I released last May! 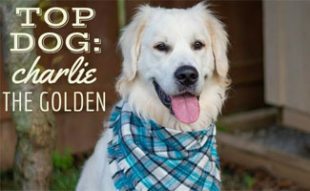 Plus, a portion of book sales go to puppy mill awareness – adopt, don’t shop!!! Speaking of her book, check out this video of Toast on Good Morning America to get a sneak peek at the book Toast Hampton. Toast for sharing your tips and stylish story with us! Toast you are TOO cute for words!! !